'Salem's Lot Limited Edition Wooden Relief Carving! Sorry, this item does not qualify for any coupons or special offers! The 'Salem's Lot Wooden Relief Carving! 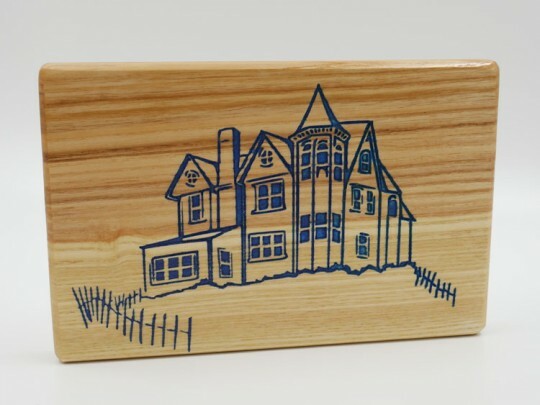 To make something like this, Dan carves out the main shape from a custom-cut piece of White Ash; the entire piece is then hand painted BLUE; and then the top layer of wood is sanded off to remove the paint on the flat surfaces while leaving the color exclusively in the carved sections, to give the look you see above. Finally, a protective layer is applied to protect the finish and the paint for years to come. For those who regularly purchase items that are made by hand, you know the other special element of these: every piece of wood is slightly different, and creating a wood carving like this means there will be small variations, so each and every one is its own, unique piece of artwork! Each of these Dan will be approximately 6 inches by 9 inches, so it won't be hard to find the perfect place on your bookshelf, wall, or display case! Dan is preparing to set aside time for a very limited run of these just for Cemetery Dance collectors, and the cost is only $100 plus shipping, which really is a tremendous deal when you consider how much labor goes into these! There won't be many made due to the time involved in the process, so please place your order ASAP!